It is snack time in giveaway land. Open to US residents only. You have through 7/9 to enter. Good luck. There’s nothing artificial about Karen’s Naturals. They produce everything in small batches, the old fashioned way with absolutely nothing added—no salt, no sulfur, no fat, no artificial flavorings, no sweeteners, no preservatives. Nothing but what Mother Nature intended. It’s the next best thing to eating straight from your garden! Their fruit and veggies are grown on farms, ranches and orchards where they are allowed to ripen naturally before being picked at the peak of flavor. The produce is handled with great care, washed gently, cut into bite-size pieces. The freeze-dried products are quickly flash frozen, and then all water is extracted by vacuum. Because the temperature never exceeds 90ºF, freeze-dried foods are considered a raw food. Our dehydrated products are dried at 125ºF. 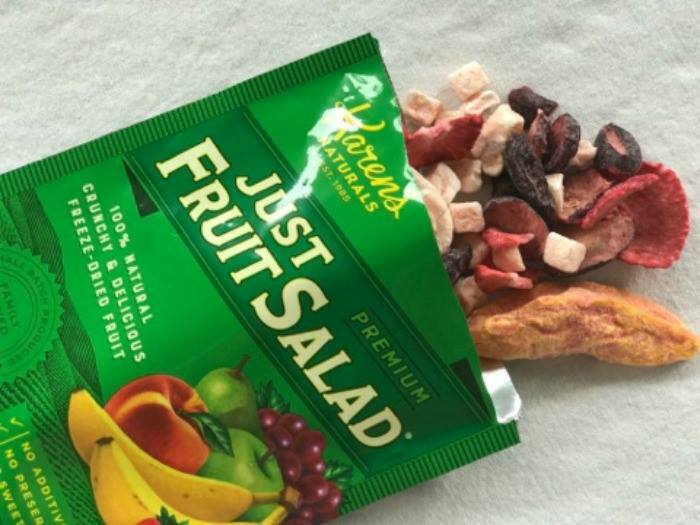 Whether freeze-dried or dehydrated, Karen’s Naturals fruits and veggies keep their color, nutrients and intense flavors, ensuring that every bite is healthy and delicious. Karen's Naturals are available in all-natural premium and organic versions. Karen’s Naturals fruit products include: Just Apples, Just Bananas, Just Strawberries, Just Blueberries, Just Grapes, Just Peaches, Just Mango, Cherries, Just Raspberries, Just Fruit Munchies, Just Persimmons, Just Fruit Salad and several combo packs. Vegetable products include: Just Tomatoes, Just Corn, Just Peas, Just Hot Veggies, and a Veggie Variety Pack. Be sure and read Kristin's thoughts on Karen's Naturals in her full review here! 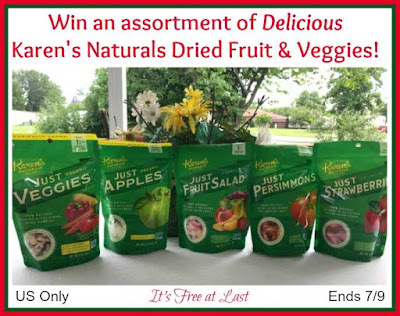 If you just can't wait to see if you have won the Giveaway, you can find them now online at Karen's Naturals, through Amazon.com and other online retailers, and at health food stores such as Whole Foods. Karen's Naturals Dried Fruit & Veggies! Giveaway ends 7/9/17 at 11:59 pm ET! Open to US residents 18+ and older. All of the fruit! The mangos and strawberries would be my first to gobble down. I'd like to try Just Persimmons, Just Bananas, and the Just Berry Variety Pack to start off with. I also like the looks of the Veggie Variety Pack. I'm excited to try Just Fruit Munchies and Just Hot Veggies first but I want to try all of them,they sound delicious! The Just Fruit Strawberries sound great! I would like to try the strawberries.